The VW Crafter can accommodate up to eight passengers and is a good option for those who wish to travel in a small group. Similarly, the company also rents out the VW Transporter Shuttle that can also accommodate eight passengers. To contact this company, you will need to complete their online enquiry form or you can speak to the company’s reps on the phone by dialling 0800 71 71 31. Trans Pentland Minibus Hire is a VW minibus hire company that offers the fourteen seat Volkswagen Minibus for hire at an affordable price. This minibus can be rented out at just 8.50 GBP per hour on any weekday. On Friday evenings, you can rent out this VW minibus for 10.50 GBP per hour and on Saturdays and Sundays the company charges 12.50 GBP per hour after ten in the evening. To contact this VW minibus hire company, you will have to complete the company’s online booking form. Transpentland can also supply VW minibuses to accommodate the needs of a group of fourteen people. Civilised Car Hire is another VW minibus hire company that offers the VW minibus on hire in London. This company allows you to hire a VW Shuttle MPV that accommodates nine persons and it has a long wheel base, leather seats, rubber floor and is air conditioned and equipped with an excellent stereo system. All these features help to make each ride on board this VW minibus a very pleasant and comfortable one. 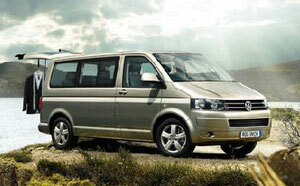 The same VW minibus hire company also provides the VW Caravelle on rent. This is a very competent as well as stylish minibus that is large enough to transport two people upfront and five people in the rear and it is also equipped with easy swivel leather captain’s chairs. To contact this VW minibus hire company, you will need to visit their office at 365 Clapham Road London SW9 9BT though you can also call the company on the phone by dialling 020 7738 77 88.